Born in Ravensbrück and rescued when six weeks old. Did he ever get to know who his father is? Ryszard was born in Ravensbrück Concentration Camp, Germany on March 15, 1945. His mother, Sabina, had been arrested by the Germans during the Warszawa uprising and was pregnant with Ryszard when she was deported to Ravensbrück in September 1944. He was only six weeks old when he came to Malmö with his mother Sabina on April, 28, 1945, after being liberated from Ravensbrück by the Swedish red Cross. 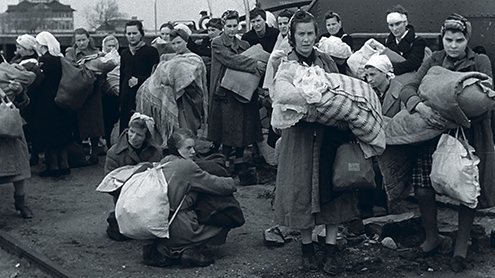 In the archive photos from the harbour on this day, Ryszard is wrapped in blankets in his mother’s arms. Ryszard was ill from typhus when he came to Sweden and was treated at the hospital in Lund. Later he recovered together with many other infants and their mothers in the Krönleins villa in Landskrona. He and 28 other Catholic children arriving in Malmö were all baptised at the same time. Ryszard was separated from his mother and ended up in foster care in Värmland. He was re-united with her again in 1949. Sabina never told Ryszard who his father is. To this day, Ryszard does not know. If you would like to add information to Ryszard Lagemo’s story we will be very happy to hear from you. Please write an email to our researcher Sebastian. If you can help us with further information about Ryszard Lagemo we will be very happy to hear from you. Please write an email to our researcher Sebastian. 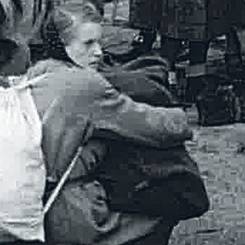 Ryszard Lagemo in the arms of his kneeling mother Sabina in Malmö harbour, April 28, 1945.